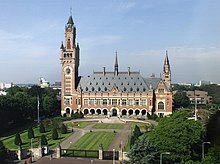 The Permanent Court of Arbitration (PCA) is an intergovernmental organization located at The Hague in the Netherlands. The PCA is not a court in the traditional sense but provides services of arbitral tribunal to resolve disputes that arise out of international agreements between member states, international organizations or private parties. The cases span a range of legal issues involving territorial and maritime boundaries, sovereignty, human rights, international investment, and international and regional trade. The PCA is constituted through two separate multilateral conventions with a combined membership of 121 states. The organization is not a United Nations agency,  but the PCA is an official United Nations Observer. The Peace Palace was built from 1907 to 1913 for the PCA in The Hague. In addition, the building houses the Hague Academy of International Law, Peace Palace Library and the International Court of Justice. The PCA is not a court in the conventional understanding of that term but an administrative organization with the object of having permanent and readily available means to serve as the registry for purposes of international arbitration and other related procedures, including commissions of enquiry and conciliation. The Administrative Council (formally the Permanent Administrative Council) is a body composed of all diplomatic representatives of Member States accredited to the Netherlands. It is presided by the Minister of Foreign Affairs of the Netherlands, who is also a member. It is responsible for "direction and control" of the International Bureau, directs the organisation's budget and reports on its activities. The International Bureau is the Secretariat of the PCA and is headed by the Secretary-General. It provides linguistic, research, administrative support to PCA arbitration tribunals. The judges or arbitrators that hear cases are called Members of the Court. Each member state may appoint up to four "of known competency in questions of international law, of the highest moral reputation and disposed to accept the duties of arbitrators" for a renewable 6-year term. Members of each member state together form a "national group". Members may be selected in arbitration cases in which the PCA provides support. National Groups may propose candidates for International Court of Justice members. The PCA sometimes gets confused with the International Court of Justice, which has its seat in the same building. The PCA is however not part of the UN system, although it does have observer status in the UN General Assembly since 1993. In the Articles 30-57 of the Hague Convention of 1899 the rules of arbitration procedure are outlined. These rules are an adapted version of pre-existing treaties among the states. They were amended in 1907, the creation of a summary procedure for simple cases being the most conspicuous change, and were relevant in the 1920s development of rules for the Court of International Justice. The first act of parties before the PCA is the submission of the so-called "compromisis", stating the issue and the competence of the arbitrator(s). Proceedings are then conducted in two phases: written pleadings and oral discussion. The Court retires once the debate is over to deliberate and conclude the case by a simple majority of votes. The decision is published as a writ, along with any dissenting opinions. Early Court decisions were countersigned by the arbitrators themselves, but in 1907, that responsibility was passed to the president and secretary (of the PCA). The writ is read to a public session in the presence of the agents and lawyers of the parties to the case. The decision is binding on the parties, and there is no mechanism for appeal. Between 2007 and 2008, the budget was 1.8 million Euro. The budget of PCA comes from the contributions of its members and income through arbitration cases. The distribution of the amounts to be paid by the individual member states is based on the system in use by the Universal Postal Union. Parties to arbitration have to pay the expenses of the arbitral tribunal set up to hear the case, including the salary of the arbitrators, registry and administrative functions, but not including overhead of the organization). The costs of arbitration vary from case to case and discussions may be held between the PCA and the parties over fee arrangements. The fixed costs for action as an appointing authority are €2000. Parties to the Convention on the Pacific Settlement of disputes of 1899 (71 member states) and 1907 (101 member states) are automatically parties to the PCA. As 51 are parties to both conventions, the PCA has 121 member states: 119 members of the United Nations, as well as Kosovo and Palestine. PCA is one of the oldest institutions for international dispute resolutions. It was established in 1899 by the first Hague Peace Conference under Articles 20 to 29 of the 1899 Hague Convention for the Pacific Settlement of International Disputes. At the second Hague Peace Conference, the earlier Convention was revised by the 1907 Convention for the Pacific Settlement of International Disputes. The Conference was convened at the initiative of Czar Nicholas II of Russia "with the object of seeking the most objective means of ensuring to all peoples the benefits of a real and lasting peace, and above all, of limiting the progressive development of existing armaments." PCA tribunals have jurisdiction for disputes based on the PCA founding documents (the Conventions on Pacific Settlement of International Disputes), or based on bilateral and multilateral treaties. Its Secretary General furthermore acts as an appointing authority for arbitration. When problems arise in designating arbitrators for an arbitration under UNCITRAL arbitration rules (e.g. because one of the parties refuses to designate an arbitrator, or when the designated arbitrators are unable to agree on designation of a third arbitrator), the PCA Secretary-General may be requested to serve as an appointing authority. This option is also open for other arbitration agreements, in which the Secretary General is designated. Between 2011 and 2015, 257 of such requests were submitted. Arbitration between two states takes place when two member states of the PCA decide to submit a dispute for arbitration to a PCA Tribunal. The Tribunal consists of 5 arbitrators, two of which are selected by each party to the arbitration (and one of whom may be a national of the party concerned). The four arbitrators choose the fifth and presiding arbitrator. a special arbitral tribunal (constituted in accordance with Annex VIII). If two member states have elected different dispute resolution measures, the third option is to be used. As of August 2016, the PCA has administered 12 cases initiated by States under Annex VII to the UNCLOS., thus administering all cases initiated under this Annex except for one. Many free trade agreements provide for a mechanism to resolve disputes between investors and states through arbitration through so-called ISDS clauses. The PCA may play a role in such proceedings as appointing authority for arbitrators, by use of its arbitration rules or by providing support to the arbitration case. ^ a b c d "Contracting Parties". PCA. Archived from the original on 16 February 2018. Retrieved 16 February 2018. ^ a b "115th Annual Report" (PDF). Permanent Court of Arbitration. Archived from the original (PDF) on 27 August 2016. Retrieved 30 July 2016. ^ a b "Secretary-General". PCA. Archived from the original on 27 August 2016. Retrieved 2 August 2016. ^ "Services - PCA-CPA". Archived from the original on 2016-06-22. ^ "History". PCA. Archived from the original on 27 August 2016. Retrieved 2 August 2016. ^ "United Nations stresses separation from Hague tribunal". Archived from the original on 2016-07-16. The United Nations clarified on its Chinese microblog yesterday that the tribunal that ruled against China's historic claims over the disputed South China Sea was not a UN agency. ^ "Intergovernmental Organizations". www.un.org. Archived from the original on 2017-05-23. ^ Shabtai Rosenne, "The Hague Peace Conferences of 1899 and 1907 and International Arbitration: Reports and Documents", T.M.C. Asser Press (2001), page xxi. ^ a b "Administrative Council". PCA. Archived from the original on 27 August 2016. Retrieved 30 July 2016. ^ "International Bureau". PCA. Archived from the original on 27 August 2016. Retrieved 2 August 2016. ^ a b "Members of the Court". PCA. Archived from the original on 27 August 2016. Retrieved 2 August 2016. ^ "International Court of Justice". ICJ. Archived from the original on 2016-07-14. Retrieved 2016-07-14. The International Court of Justice (ICJ) wishes to draw the attention of the media and the public to the fact that the Award in the South China Sea Arbitration (The Republic of the Philippines v. The People’s Republic of China) was issued by an Arbitral Tribunal acting with the secretarial assistance of the Permanent Court of Arbitration (PCA). The relevant information can be found on the PCA’s website (www.pca-cpa.org). The ICJ, which is a totally distinct institution, has had no involvement in the above mentioned case and, for that reason, there is no information about it on the ICJ’s website. ^ "Arbitral court not a UN agency". Archived from the original on 16 July 2016. Retrieved 20 July 2016. ... they confuse the PCA with the UN’s International Court of Justice (ICJ). ^ "A/RES/48/3 29th plenary meeting 13 October 1993". United Nations General Assembly. Archived from the original on 24 January 2006. ^ "General Assembly of the United Nations - Observers". UN. Archived from the original on 2017-06-16. ^ Eyffinger, Arthur (1988). The Peace Palace: residence for justice, domicile of learning. Carnegie. p. 136. ISBN 9066113316. ^ "The Permanent Court of Arbitration". City of The Hague. November 2008. Archived from the original on 14 September 2016. Retrieved 31 July 2016. ^ Art. 85 Convention for the Pacific Settlement of International Disputes (Hague I), October 18, 1907. ^ "Schedule of Fees and Costs". PCA. Archived from the original on 2018-05-12. ^ "FAQ, PCA-CPA". Archived from the original on 2016-08-27. Retrieved 2016-07-14. The costs of arbitration vary from case to case. To promote maximum flexibility in each case, the PCA has no fixed fee schedule. The PCA assists the parties and tribunal in finding a fee arrangement that is most appropriate for the case. ^ Loukas A. Mistelis (1 May 2010). Arbitration Rules-International Institutions-3rd Edition. Juris Publishing, Inc. p. 300. ISBN 978-1-933833-56-9. ^ "PCA Secretary-General as Appointing Authority". 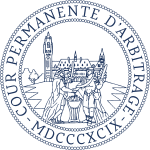 Permanent Court of Arbitration. Archived from the original on 27 August 2016. Retrieved 30 July 2016. ^ "1907 The Hague Convention for the Pacific Settlement of International Disputes". Archived from the original on 16 August 2011. Retrieved 31 July 2016. ^ "United Nations Convention on the Law of the Sea". PCA. Archived from the original on 27 August 2016. Retrieved 31 July 2016. ^ "INSTRUMENTS REFERRING TO THE PCA". PCA. Archived from the original on 27 August 2016. Retrieved 31 July 2016. ^ "PCA-CPA". Archived from the original on 2013-10-19. ^ "PCA-CPA". Archived from the original on 2010-12-13. ^ "PCA-CPA". Archived from the original on 2014-07-30. ^ Judge George H. Aldrich, "The Iran-U.S. Claims Tribunal" in P. Hamilton et al., ed., The Permanent Court of Arbitration: International Arbitration and Dispute Resolution, Kluwer Law International (1999), p. 208.